It had never happened to me before. Not like this. I couldn’t believe it. I had been so successful in avoiding it. I didn’t really see the need for it. I didn’t see the point. I’d always see these ditzy girls pretending to know about sports and laughing that fake hyena laugh just to get close to one of my friends. I didn’t understand what that was about. These guys were like my brothers. These guys were “the guys,” and me being the tomboy that I was … I was one of the guys too. I had always been. So I never understood the ditzy girls. And then it hit me. I don’t know how it happened, but it did. And it didn’t take a week, a day, or an hour. It took a second. Maybe less than that. Maybe it was a split second. I don’t know if that’s faster, but it felt faster. Like speeding. It didn’t slowly creep up on me. It pounced. It wasn’t a pitter-pat. It was a BOOM-BOOM. I saw him and it hit me. The BOOM-BOOM. I had recognized this special effect. I had only had it once before with Rafa, but this time was a little different. It was louder and there were more butterflies. The butterflies were in the pit of stomach. 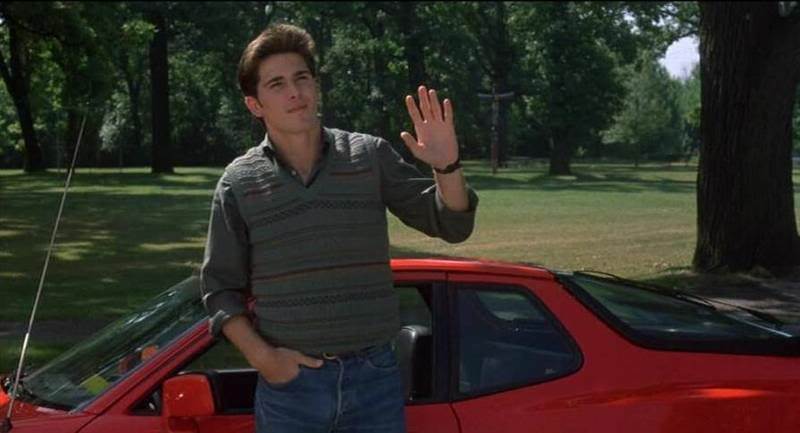 It was the Jake Ryan–Sixteen Candles–Somekind of Wonderful type of BOOM BOOM. There was no music in the background when it happened. No Thompson Twins, Tears for Fears, or Peter Gabriel. Just silence and slow motion. He walked across the basketball court in a t-shirt, blue jeans, and white high top Nikes with the blue swoosh. I locked into his Ryan Gosling eyes as he smiled and said hello. It only took a second. A split second, but it had changed my life. Love. Head-over heels-kissing-in-the-rain-first-love-kind of love. I hadn’t become one of those ditzy girls, but I sure understood it. I was never the same. LOL… This is an awesome post. My wife shares your enthusiasm – she’s straight like you, until I put on my rollerblades and skate. I turn her, from proud, strong mother into a babbling teenager (at heart) in seconds. It is absolutely cool as you get. I take her skating often now. Ha! I love your wife now 🙂 Some of us are built that way we’re strong and proud and then BAM! The BOOM BOOM! Ahhhhh totally changes everything. Crazy love. Well at least you can admit it. That’s the first step. Now–not really sure if there are more steps to this. I guess, embrace it and enjoy the feeling. I love the John Hughes adjective tribute. So many of us define our lives by those movies. I still have a place in my heart reserved for Molly Ringwald. Thank you for taking me back to high school and the innocence of first love. Don’t even get me started on Lloyd Dobler. I just devoted a chapter to him for my NaMoWriMo novel this very day. “I can’t figure it all out tonight, sir, so I’m just gonna hang with your daughter.” That pretty much sums up my life. He’s totally BOOM BOOM. Jake Ryan set that bar high for me. I’m BOOM-BOOM-ing with joy. Awesome simple story. Very exciting, and with a very lovely ending. It’s true that even those nano-second can last a lifetime. What a grand moment :). I remember that moment!! I was 14. His name was Sam. I’ve never seen anyone with such an amazing smile in real life 🙂 It was honestly hard to form words in his presence lol. Oh that crazy BOOM BOOM feeling! Hehe, thanks for the fun post! Wonderful story and I would so much rather read posts like this than 50 Shades of Crap. Sorry to offend if you like that series, but I like reality better.